The Greater Silver Spring, MD area has a variety of older subdivisions where you can find mid-century modern homes, classic Bungalows, white-washed brick Colonials, Victorians, Tudors and turn-of-the century (19th that is) Farmhouses. What these sellers do not realize is that older homes that feature (yes, I said feature) original details are hidden gems! Vintage is in! There is a market for it! I have been on the hunt to find just such a gem with several buyers over the last few years. They gladly pass on the new construction and say Thank you but no thank you to an updated home that was stripped of its personality. Let me say it again: there is a demand for older homes with original details intact! The mid-century modern in Ellicott City, the Stone Cottage in Silver Spring, the Victorian in historic Relay, the 1940s Colonial in Catonsville and the Farmhouse in Mount Rainier .. I have a story to tell about all of them. 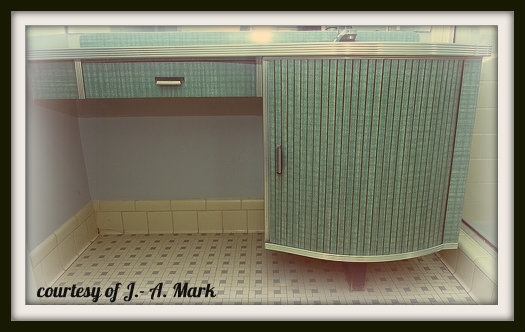 This picture is of an original 1955 vanity that we found in a rambler in Ellicott City, MD - and saved from a trip to the dump. There was a remark in the listing that "the master bedroom vanity will be replaced before closing". We saw what the seller was planning on replacing it with, it sat in a box in the garage. When we wrote our offer we requested that the seller do not touch that vanity! The new owners - my happy buyers - have been on a mission to restore their mid-century home since settlement. They are still on the hunt for another 1950s vanity to replace the replacement in the 2nd full bath ... a pink bathroom I might add. They saved a pink bathroom! and are proud members of a growing fan club. Like I said, there is a market and there is demand. If you have a mid-century modern home, Bungalow, Tudor, Cottage, Colonial, Cape Cod, Victorian, Farmhouse in Silver Spring, MD and beyond to sell, don't listen when someone advises you to update that original vanity or to cover up the hardwoods or replace the 'worn' hardware! Don't update! Restore instead or set out to find a buyer who is hunting for that hidden gem! I can help you with that. Original details are charming. Charm is in high demand. Vintage homes are hidden gems. Want to know what vintage homes are currently for sale in Silver Spring, MD? Just send me a message and I'll get back to you with a list! Hi, Andrea...I love the older homes. I truly do. I live in one right now. I have some work to do, but it has so much potential. It is so sad when an update is poorly done - cheap materials are no substitute for original style! I adore the charm Debbie. There is just something very unique about older homes, they have personality. It's very sad Lisa! There are so many ways to bring back personality! If original cupboards, vanities etc. are not salvageable then there are the ReStores to hunt for charming pieces.. or, if it has to be something new, then there are a variety of design elements made to look vintage which tie in beautifully with an older home. Andrea, excellent post and idea! Just because something is new doesn't make it better. I also have seen many flips where poor quality materials were used such as melamine cabinets when the original cabinets could have been rehabbed and restored to like new and left intact keeping the original character of the home. I hope homeowners hear your message and call you. Andrea, if they did decide to replace that vanity, they could have sold it for a boatload. Thank you Pamela! Sometimes all it takes is some paint and new hardware.. I have seen some beautifully restored homes. They are warm and inviting and just overall charming. The bad flips on the other hand just look cheap and cold. Patricia, the sellers and listing agent were completely oblivious to the fact that this original vanity was a true treasure. They thought they would "update" the bathroom with that building store vanity. For people who loves older homes like me, it's so sad that some restorations didn't work out well. That's why you have to make sure you only hire the professional ones who really knows what they're doing. Knows how to restore an old home durability wise and appearance. I even like to keep things that are still utilizable just to keep the vintage ambiance of it. Like the retaining wall it's still intact. Thank you for stopping by and your comment Todd! I couldn't agree more.. a professional who not only knows what he is doing but admires vintage craftmanship just as much. There are soooo many ways to repurpose things as well.